The Boston-based auction house Skinner has pulled seven lots from its forthcoming American Indian and ethnographic art sale (1 December) amid protests from Native American organisations. The 19th-century objects had been consigned by the Medford Public Library in Massachusetts, a library outside Boston that was given the objects in 1880 by James G. Swan, a Medford-born ethnographer who is best known as one of the earliest indigenous art collectors for the Smithsonian Institution. 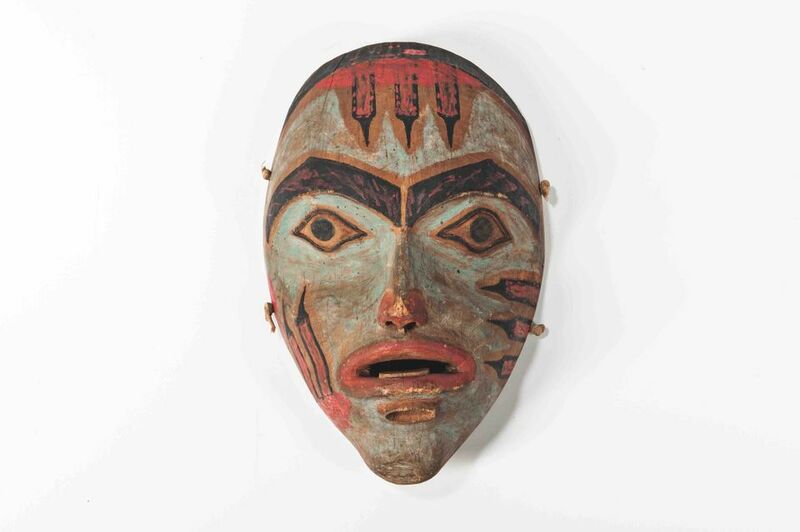 The objects withdrawn from the sale include a Tlingit shaman’s spirit figure (est $4,000-$6,000), a Nitinat polychrome trunk (est $3,000-$5,000) , a Northwest Coast polychrome totem pole (est $800-$1,2000), two separate Bella Coola shaman’s bird rattles (est $5,000-$7,000 and $6,000-$8,000), a Tlingit male shaman’s mask (est $30,000-$40,000) and a Tlingit female shaman’s mask (est $30,000-$50,000). In a notice released last week (13 November), the city of Medford described the pieces as surplus goods being sold to finance the construction of a new $34m library. The objects had not been displayed at the library in several decades, and some probably had never emerged from storage prior to being catalogued for the sale. The objects potentially could be repatriated under the Native American Graves Protection and Repatriation Act (Nagpra), a law passed in 1990 that obligates institutions receiving federal funds to have their holdings of Native American objects and human remains inventoried and to allow Native American tribes the right to recover them. In an official statement, Jean-Luc Pierite, the president of the board of directors of the North American Indian Centre of Boston, says the 1 December sale was “unconscionable in a country with laws and obligations such as Nagpra”. He adds, “To sell these items for a short-term profit without proper consultation on repatriation is part of the troubling disregard for government-to-government relationships”. Pierite tells The Art Newspaper that he advises the library to consult with tribal representatives to properly identify and repatriate the seven objects. He also points to other lots in the sale being offered from the collection of the Northampton County Historical and Genealogical Society of Pennsylvania, which the auction house “contends were made to be sold, but we know that's not true because these are items of spiritual or ceremonial value that are owned by the tribe in whole”, he says. A spokesperson for Skinner Auctioneers told us the auction house “recognises and respects the importance of objects of material culture to the indigenous people who created them and whose heritage they present, and also respects and complies with Nagpra and all federal laws governing the transfer of tangible property”. The auction house adds that it “acknowledges the complexity of the legal and ethical landscape surrounding the sale of important works of art, and works actively to resolve such complexities in a transparent and ethical manner”. Earlier this month, the Association on American Indian Affairs (AAIA), a Native American advocacy group, denounced the Metropolitan Museum of Art’s exhibition Art of Native America: the Charles and Valerie Diker Collection, which includes more than 100 promised gifts, loans and donated pieces from the collection of the New York philanthropists. Some of the objects could be up for review under Nagpra, said Shannon O’Loughlin, the executive director of the AAIA, although most do not meet Nagpra requirements for potential repatriation. This story was updated to add a statement from Skinner Auctioneers.